Thanks for the link Chessie. I am definitely praying for others on this website. We all need it so much! Day 26 from reinstatement. Symptoms are still prevalent. Ebbing and flowing. When taken, Propanolol is masking some of them to a good extent, thank the Lord.. Question 1: almost 30 days out, can anyone say the reinstatement was/wasn't successful? Since this began, I've learned that switching SSRIs without tapering can also cause withdrawal. I believe this occurred in a situational depression I had many years ago when a physician's assistant switched through 2 SSRI then back to Lexapro in 3 month's time, when the initial Lexapro didn't ward off the episode. That took 5-6 months to fully resolve. Question 2: Any thoughts as if the first episode above is an indicator of how long this might take knowing I didn't have depression when I jumped off. NOTE: For anyone interested, 5 mg of Propanolol has been a Godsend for me. It is too soon to tell. While some notice relief soon after reinstatement or updose, for others it can take weeks or months. Another question. I ordered Taurine after reading it was helpful to some. Trying to combat the akathisia. Any harm in trying 500mg? From the posts I've read, it doesn't seem to be a problem. I think Alto tried it and thought it helped her. Some members have found it helpful (see link below). As always with supplements, start with a low dose to make sure it agrees with you. It's a nice Dec day in the 40's.🌞 I think I'm seeing slow improvement but not today. It's day 29 of wd, I'm feeling rather flu-like ill. Propanolol has masked the parethesia and edgy feeling mostly. It's most pronounced in the morning as others have said. Can't call Dr. since he has advised to up-dose to 10 mg starting tomorrow. For now, though, I'm holding. The last up-dose 7 days ago seemed to help round out the symptoms but I'm not sure. A sleep pattern has set in it seems... where every 2nd or 3rd day insomnia hits but mostly its early rising after 3.am like this morning. What seems to be relatively new is the myclonus jerks. Mostly when I'm lying in bed. Does anyone know if they'll disappear at things settle? I tried the Taurine today and yesterday. Not sure it is helping or hurting. I'll forego tomorrow as a trial. Still taking daily 5 mg Propanolol which helps immensely to mask the non-flu symptoms. For me, it proves 1 Corinthians 10:13 which says, "No temptation has overtaken you that is not common to man. God is faithful, and he will not let you be tempted beyond your ability, but with the temptation he will also provide the way of escape, that you may be able to endure it." Today, I am thankful that I'm not housebound, that I can still enjoy family and friends (albeit not at full speed) and for this site that gives so much critical information that is difficult, if not impossible, to find elsewhere. Praying for all that today is a better day than yesterday and that healing comes quickly. 🙏 The Lord is still in charge and that comforts me greatly. I've merged the new topic you created with your Intro topic. Your Introduction topic is where you ask questions about your own situation and journal your progress. Each members has only 1 Intro topic. Please post updates here in your Intro topic. Thank you. The doctor's nurse just called to say my Dr. has now agreed, I'm going thru withdrawal. He suggests the following. Reduce Lexapro to 5 mg. or split 7.5 mg into 2x daily for better absorbtion; or bridge to prozac to address symptoms (not for tapering). Thoughts? I'm not sure I understand his thinking? Going through withdrawal so reduce??? Does not compute. Or in English, does not make sense. Unless he is suggesting an increase and taking 5mg twice a day. If you decide to split your doses move 1/2 the dose by 1 hour each day. Keep daily notes on paper. If you are currently taking in the morning, you need to be careful that you don't disrupt your sleep. If your sleep changes, you could move the dose back by 1 hour to find a time which doesn't affect sleep. It is usually best to taper off the drug you are currently taking. If you change over, you can get withdrawal from the old drug, you might get start up, side effects and/or bad reaction to the new drug. You won't know what is causing what. I have had previous experience with Prozac and it caused weak muscles. If I didn't have the existing knowledge of this side effect and I changed to Prozac, I wouldn't know what was causing it. Thanks Chessie. This site is unbelievably helpful. Putting our medical community to shame. I am thinking safest thing to do, is try the 1/2 dosing. Do you agree Chessie? Do you think this will have any effect? Also, are you suggesting that if I normally take it at 7, then the next 1/2 dose should be at 8; next day at 9; next day at 10 until I arrive at a stable set pm time? What time, in your opinion, would be best for the second half to avoid sleep disturbance. I am already having difficulty sleeping past 4. It seems the nature of symptoms are morphing a bit. Less intense but still there. Does this mean reinstatement has taken? Do new symptoms pop up as we heal? New symptom is dull frontal headache. Feeling heavy headed. Is that normal? I am thinking safest thing to do, is try the 1/2 dosing. Do you agree Chessie? Do you think this will have any effect? You were the one that mentioned splitting your dose. I was just letting you know the best way to do it. I don't know whether it will help or what problems it might cause. That's why you will need to be diligent and keep daily notes on paper so you can notice any changes as soon as possible. Yes that is the way to split the dose in a gentle way. What time, in your opinion, would be best for the second half to avoid sleep disturbance. I am already having difficulty sleeping past 4. Keep daily notes on paper. If you are currently taking in the morning, you need to be careful that you don't disrupt your sleep. If your sleep changes, you could move the dose back by 1 hour to find a time which doesn't affect sleep. If your sleep changes you would not move it any further towards night time. You could either stay at that time and hope that things improve, or move it backwards 1 hour and see if that helps things improve. Whatever you do you need to do it gradually. I have more questions based on my data and reading. I would be so grateful if staff and/or Alto would provide their opinions. My days seem to be improving gradually. Especially the days where I get a good aerobic workout. However, mornings tend to be very, very difficult waking early 4-5 am and then warding off strong feelings of fear and despair with calming techniques. As the day progresses, distractions and exercise help to alleviate many of the symptoms. Above is a chart of akisthia- like symptoms and since this began. Beginning 12/3 - Daily 5mg of Propanolol helped to keep the akathisia-like symptoms down over most of those days. December 14th, yesterday, I did not take Propranolol. Question: Does the above data suggest improvement toward stabilization to the staff here? "After 15 years, most — but not all — people are going to have serious symptoms when stopping SSRIs and SNRIs. There are people who are able to stop these drugs (even after long-term use) with minimal tapering and yet will have no discernible problems. Many people are going to have transient, mild to moderate difficulty and some are going to end up falling down the akathisia rabbit hole. That is a long, difficult drop." "Speed of tapering is generally best done slowly to reduce acute symptoms, but I am finding that even exquisitely slow tapering may not alter the course of late-emerging symptoms. Still, speed of tapering is really one of the only strategies available to mitigate withdrawal emergent akathisia." "For people who have been on the drugs for less than five years, my basic starting point is to drop 10% every month or two until halfway, and then 5% the rest of the way." This seems to suggest he doesn't recommend coming off for people who've been on the drugs over five years. "Although there are no fixed rules, once long-term akathisia-like withdrawal symptoms occur the recovery is best measured in years, not weeks or months. It seems the key words here are long-term? Is he talking PAWS? As long as the general trend is improvement, then one can expect that over time there will be complete recovery. Question: Does the staff agree with the above statements? Question: Is Dr. Shipko recognized as an authority on the subject? Should I read his material to become more accurately informed? Question: Is there literature that discusses PAWS occurring in long term users after an appropriate slow stable taper? A book, an article, personal stories, etc? In a separate message, a moderator stated, "PAWS does happen, but n﻿ot all that often. If you have a slow stable taper it's something that doesn't need to be worried about." However, I have found nothing on the site that says this is so. There are references in older posts that suggest a slow stable taper doesn't guarantee one won't fall down the PAWS rabbit hole when jumping off, especially for long term users. I've read posts of people tapering to very low doses and holding, for good, afraid to make the jump. Question: Is this because of the fear of PAWS even after a long slow taper? Question: Does this strategy worked to prevent PAWS? I also suggest that you learn Acceptance. Use the image of waiting in a queue, the line gradually gets shorter. When you are in a queue you can't make it move any quicker than it does. You have no control over it. All you can do is wait in the line. How you wait is what is going to make a difference. You can either be impatient and start getting irritable and think bad things and complain to the other people who might start swearing at you which makes you feel worse or you can try to be patient and calm and try and think of nice things and look at the things around you. It's going to take the same amount of time for you to get to the head of the queue but you can either make the experience of waiting pleasant or unpleasant. My days seem to be improving gradually. You've already stated that your "days seem to be improving gradually". I could immediately see a pattern of improvement. However, mornings tend to be very, very difficult waking early 4-5 am and then warding off strong feelings of fear and despair with calming techniques. Keeping the bedroom dark (blocking out the light) and/or wearing a sleep/night mask can help. "This seems to be a very common symptom of withdrawal syndrome. Many people report waking up with a surge of panic or anxiety, or a feeling of anxiety early in the morning. A lot of times, people are waking around 4:30 a.m. or closer ﻿to dawn. The first glimmers of morning light signal the nervous system to start the morning cycle with a jump in cortisol. At normal levels, cortisol gives you energy. At elevated levels, cortisol gives you a feeling of unease, anxiety, panic, or depression. When you have withdrawal syndrome, your system is on "high alert" all the time. The normal morning peak of cortisol gets exaggerated and what you would normally feel as "wake up" becomes a surge of panic, anxiety, or dread in the early morning." Alto (2nd post in the above topic): "I disagree with Dr. Shipko. And we see people recovering from this syndrome all the time." It is still very dark when I wake where I live. No light outside so the mask and room darkening shades won't help. It isn't a matter of acceptance for me. Rather, it's a matter of reading and digesting this site content and being triggered by the messages on the long term effects so many have suffered.. We are all seeking a glimmer of hope in your expert opinions from time to time as to whether the we are on the right track toward recovery. It does SO much when you and the others affirm that we are. I had read the 'mornings' post as I've just about covered most content on this site. Some of which is dated and out of context; nevertheless, most is indeed extremely helpful! Yes, room-darkening can help. Indiana is not in Antarctica. Sorry about the triggering. Everyone needs to come to terms with where they are now. This can be difficult. "Some of which is dated and out of context"
Thanks Alto for weighing in. I got a laugh at your comment and that is a good feeling. In researching site content, I've found that the some of the material goes back a ways. It seems staff have been on top of pointing out the new material (For ex. Dr. Shipko's modified views on the benefits of tapering). When reading the older threads though, it's not always apparent that newer information is available or the dialogue may veer off topic; like in any conversation. I've had to keep in mind that the information in the older posts may not be the newest information on the topic. Question: In properly tapering at 10% or micro tapering and holding based on your body's signals, has anyone ever crashed (set off the w/d syndrome that lasts months to overcome like what several of us are going through)? I'm not finding posts related to that or other information which specifically says that a crash is still possible even when tapering according to this site's definition. As we taper down, will our body always give us clues that we're getting too close to the edge of a crash? So that we can hold for some time or back up? Yes, your body will give you clues in the form of symptoms. If you listen to your body, and slow your taper or hold, you will be fine. Some people can't taper at 10%, so they will need to taper with a smaller drop and/or longer hold. I also think there will be an element of pain/suffering if you want off this stuff.. I think thats the reality. I have suffered but always been happy i was off the poison. Thanks Chessie. I reread that section and gained additional insight. And... this jumped out at me by a member named dcrmt. "Personally though I don't think tapering has much relevance for protracted withdrawal symptoms, maybe a bit but﻿ I've run into quite a few people who've suffered them regardless of having tapered". This is the question at the top of my mind given the length of time I've been on the medication. I understand no one can say for sure but if there are 'quite a few' who've had protracted w/d after an appropriate 10% taper, it would be very helpful toward making my decision. Or is it really just Russian roulette and you take your chances when you jump off at 0. Something to consider. When people get well they leave hospital. When SA members are doing okay they may not come back to post about how they are doing. Why would they, they don't need SA any more and are off living their lives, just like we all hope to be doing some day in, hopefully, the near future. The SA members who aren't doing very well need support and continue to visit the site. Today is day 50 into w/d crash. The windows, when they come, are brighter and remind me of how it was 55 days ago as the sun was shining and I was taking my last pill, naively, according to Dr's advice. Such is life. I think to myself, maybe I'm over half way through this madness, but then who knows? Symptoms are still very uncomfortable but have been manageable - sometimes barely. From an intensity level of 9.5, they now seem to be averaging around 5.5. Once in awhile a very unpleasant anxious feeling of not coping swells and then subsides into the murkiness of blah, gloom, nausea and fuzzy head feeling. I feel envy, also as the rest of the world goes on about it's business. Mornings, like other's have said, are awful. It makes getting up difficult as it seems the whole day will be like so. But, thankfully, the day always seems to improve, lesser or greater. And I do engage to the extent I'm able rather than holing up in my 'SSRI bunker'. Yet, the strange feeling of being 'not right' is ever present. Vestiges of the akithisia-like symptoms dying out as the re-drugged mind heals, perhaps. I am thankful for what I've now learned about this drug. I don't know if I can ever stop taking it despite the panic I now have that I must stop taking it. I haven't been able to satisfactorily assess the risk for PAWS from the responses to my questions, reading other's stories and the resources supplied on the site, though I continue to try. In the success stories, I also wonder about the original reason the folks had for beginning the medication. For those, like me, who had depression/anxiety, how do they plan to cope with those underlying illnesses off meds? Healthy, mindful living and meditation go along way toward prevention. But, when the depression switch flips on, as it did for me in extremely stressful situations, none of that 'seemed' to be relative or helpful in switching it back off. The resulting symptoms were debilitating. The medicine 'seemed' to make them go away in time. There doesn't seem to be a non med answer after the switch is thrown. At that point, post taper, will a medication even work? Maybe the answer is to hang at the lowest tapered dose possible as others on here have suggested. I don't know. Sorting through all of this has been a quagmire for a brain in w/d. For now, it needs stability and then rest. I hope and pray that happens soon. Correction... It is only day 35 into w/d. Wishful thinking of an addled brain. 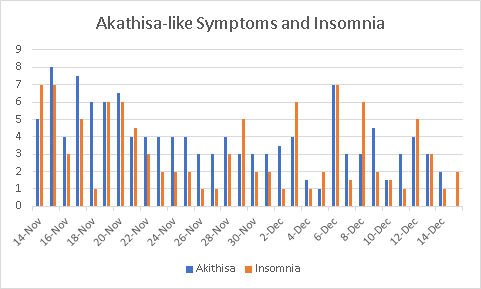 Insomnia and Akithisia-like symptoms from 1-4 am. It was most unbearable. For only the 2nd time since this started in Nov., had to take 5 mg Propranolol in the middle of the night. Usually only take during day, if needed. Within 1/2 hr, the tension, inner restlessness and burning faded enough that I was able to doze in and out of a troubled rest until 6:00 am. Below is an updated chart. Up-dosed on Nov 20th and Dec 6th. I'm wondering if the chart shows the Dec. up-dose is causing more problems? The graph is a little misleading with the Akathisia-like symptoms since many of the charted days, I was taking 5 mg of Propanolol to reduce the intensity of the symptoms. Hi Gridley. I've definitely read and reread that link thanks! According to below paragraph, I'm still in acute withdrawal symptoms, correct? So when I stabilize, it marks a rise in level of WDnormal. Since I technically cted off 2.5 mg Lexapro then RI 4 days later, I guess the last sentence applies to me. What does it mean in your opinion? That positive results will be much harder to recognize and take a longer time to appear? I am interested in hearing other's thoughts on how they felt after stabilizing after a crash (before tapering). At first WDnormal will be all the things that one is feeling at the time, acute anxiety, panic, extreme swings in mood, total lack of emotion, energy and caring. From there the acute withdrawal symptoms are the first to stabilize. ﻿ As I have mentioned this can take many months, but when a person is stable it marks a rise in the level of WDnormal. Once their taper has been started it may be several more months before any stable improvement is noticed. And so, it goes through out withdrawal. People who haveCTed or Fast Tapered will also see positive results but because of the turbulent nature of their experience it will be much harder to recognize and take a longer time to appear. Unfortunately, having a very bad wave today. Is there any thoughts on adjusting the dosage up or down? Or just ride it out best as able? This may be one of the worst waves yet. Thats something you ride daily mate. I found accepting that helped. Thanks Leo. I’d just settle for Stabilizing for now. But i have been off 7 months and i did a 1 week taper lol. I know i know. I was only on the drug 5 month. Lexapro up to 20mg. It has been a rollercoaster 7 month. 1 window, some ok days and some awful awful days. Im a 100% non linear healer. 11 am - went for ride with friend. Was hyper sensitive to conversation and car rocking. Had to return home; the nausea and feelings were overwhelming like I could faint. Almost felt I needed to stop at hospital. 1 am - woke tense unable to sleep but faded in an out. 9 am - feeling about the same as yesterday though I do feel a little ebb and flow of the intensity. I have read that Propranolol can cause nausea, sleeplessness and anxiety so I am avoiding it today. Very concerning for me as 5 mg has been my default on days when the akithisia-like symptoms were overwhelming. I may try again if it gets bad. I am trying to stick with non drug techniques for now but feeling a little desperate without the Propranolol should the intensity rise. I do have Lorazepam as a back up if absolutely necessary. I assume that is what the medical providers will do and worse if I can't cope. So I will cope. Even if it means locking myself in my room while the family is home and activities ramp up over the next week. Thank goodness they know and are loving about the whole issue. Praying for a window any time now. PS: I updated my signature profile with past ADs. Questions - The link to Propranolol tapering on this site doesn't really talk in terms of dosage/time used. My Dr.'s nurse told me at 5 mg. (even if used daily for 3 weeks), tapering shouldn't be necessary. Do the moderators agree? I have waited now 15 days since up-dosing and the change has been a rocky pattern, up-ticking dramatically these past two days. By following the Doctor's advice to reduce to 5 mg (2.5 twice daily), do I risk further destabilization? Is that why Chessie said it makes no sense? If the amount is too much, then perhaps it's creating more issues preventing stabilization and a reduction could help? Is that faulty logic? Should I follow doctor's advice and reduce from 7.5 mg to 5 mg @ 2.5 twice daily to see if the lower dose reduces symptoms? Or will that risk further destabilization - God forbid? It's been 16 days since up dosing on 12/5. The chart above shows impact. What if you have a delayed reaction down the road as may be the case here? I appreciate the response but it's not clear why it doesn't make sense if the higher dose is problematic. The above seems to suggest that the right reinstatement dose is sometime hard to find and that a change might help? While I'm waiting for an answer on the above post, I decided this morning to take only 5 mg. of Lexapro and to see how I felt. I have had a window most of the day with very little symptoms. Too afraid to destabilize, I took the other 2.5 mg. just now in the afternoon. Is it purely coincidental that after such an awful wave the last couple of days, including awful insomnia last night, that today seemed so good at the reduced level? Placebo effect? Hello. I'm hoping that all had a Christmas window and were able to enjoy their holiday in relative peace. It was somewhat rough for me but better than it has been. Last night as I was going to bed though, I had a very welcome breakthrough of my old self confidence. It was the shot I needed to remind me that this is truly temporary though so painful. I had an important meeting this morning I was concerned about making. However, it went fine and this afternoon has been as close to normal as I've felt in a while. So it definitely has been a welcome window coming off of a big wave that lasted for 4 days. Praying for all that their window/stabilization/recovery is coming.